Do you have a smile that you’re self-conscious to flash in public? Or, maybe you even avoid photos because of the flaws in your grin? Thankfully, we have a solution that can transform your smile into the set of teeth you’ve always dreamed of. Dr. Christopher Cowell is experienced in providing patients with beautiful porcelain veneers in DeLand to enhance one tooth, multiple teeth, or even their whole smile. Keep reading to find out if porcelain veneers are right for you. The porcelain veneer process occurs over 2 dental visits. First, Dr. Cowell will discuss with you your desired results, and then he will remove a slight portion of your dental structure to make room for your veneers. 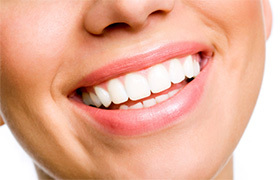 Then, he will take impressions of your smile, which are used to create your custom-made porcelain veneers. While you wait about 2 weeks for your permanent veneers to be made, you’ll be given temporary ones to maintain your smile’s appearance. Once your veneers are made, you’ll come in to visit our office for the second time, where Dr. Cowell will ensure that you’re happy with your results. After you have given your approval, he will bond your permanent veneers to your teeth to create a beautiful and lasting transformation. 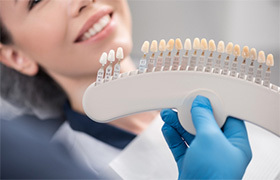 The cost of your porcelain veneers will vary based on many factors, but the main variables are the number of veneers you will need and the state of your oral health. The only way to get a fair and precise estimate is to visit our office for a consultation. 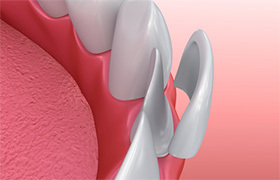 Dr. Cowell will give your smile an in-depth examination and develop a personalized treatment plan based on your mouth. Once this is done, we can give you a more exact price for your porcelain veneers.